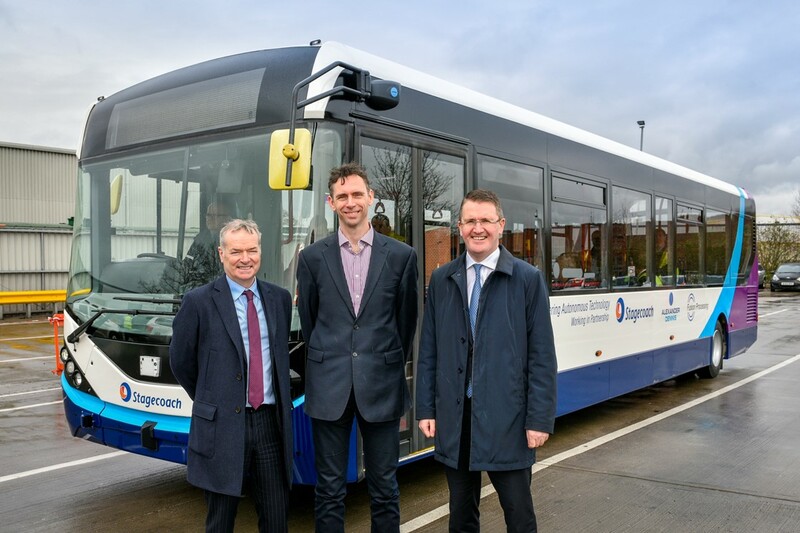 Image: Stagecoach CEO Martin Griffiths, Fusion Processing CEO Jim Hutchinson and Alexander Dennis CEO Colin Robertson. Photo: Courtesy of Alexander Dennis Limited. The first full-sized autonomous bus in the UK has begun trials at a bus depot in Manchester. Involving a single-deck vehicle, the project is part of a programme taken up by transport operator Stagecoach in partnership with bus manufacturer Alexander Dennis (ADL) and technology firm Fusion Processing. During the trials, the 11.5m ADL Enviro200 vehicle is able to operate autonomously within Sharston depot. The technology could also provide future road safety benefits for vehicles operating in manual mode. The CAVstar system, provided by Fusion Processing, has been fitted on the ADL-manufactured bus and is being trialled by Stagecoach. As part of the trial, the bus is being used in autonomous mode within the depot to carry out movements such as parking and moving into the bus wash. The first public demonstration of the bus was held on 18 March 2019. The CAVstar control and sensing system was used in the UK’s largest public trial of autonomous vehicles so far, in Greenwich in 2018, and several other projects. Using multiple sensor types, including radar, LIDAR, optical cameras and ultrasound, along with satellite navigation, the system detects and avoids objects, in all weather conditions, and plans an optimum path for the vehicle. The software used in the pilot vehicle will also be the basis for an autonomous vehicle trial scheduled in 2020 when five autonomous buses will operate, carrying passengers, between Fife and Edinburgh, across the Forth Road Bridge Corridor. The CAVForth project team, which includes Stagecoach, Transport Scotland, ADL, Fusion Processing, ESP Group, Edinburgh Napier University and University of West of England, secured Innovate UK funding of £4.35m in 2018. Vehicles in both trials will be used autonomously to Level 4 standard, under which a safety driver must remain on board in line with UK regulations. The technology can also be used to help improve the safety of road users in manually driven vehicles. The sensor system on the vehicle can be used to provide assistance to the driver by warning of cyclists or pedestrians who may be in the blind spot or arrive unexpectedly close to the vehicle.